The squeal of smoking tires, the roar of the engine and the thrill of a hairpin turn in a power drift. Most people in the future have no knowledge of these adrenaline-pumping aspects to driving because they only use cars driven by AI computers. However, sometimes the computers lose themselves and the cars race out of control! Fortunately, the éX-Drivers still love their gas-powered racing cars and are hired to shutdown rogue AI cars usingtheir amazing driving skills. 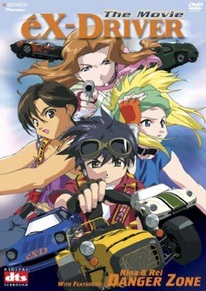 Three teenage prodigies, Lorna, Lisa and Souichi, go to Los Angeles to participate in a world-class race of éX-Drivers. As they prepare, they soon suspect that underground gambling and the mob may be involved- the thrill of the race is about to éXplode with this more sinister danger! Miniature menace! A rogue vehicle has beenshutting down Tokyo's transportation grid even though it's only 1 foot long! When Nina and Rei attempt to stop the remote controlled car, they discover it is a miniature version of Nina! Who's built this tiny terror and why? !